I found myself picking this up after reading Eleanor & Park. 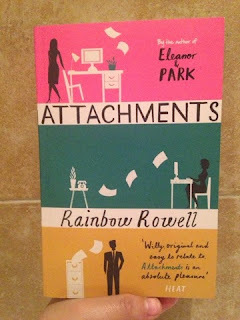 It was my second journey into the Rainbow Rowell world and I had high expectations. The book follows 20 something Lincoln who is perpetually incapable of growing up. He has never quite got out of education and nor has he got over childhood sweetheart. Back home, living with his mother, he has taken up a job as part of a security team, working nights for a newspaper. In a pre 2000 world where the internet is still a novelty, he is set to guard the ever abused, e-mail system. It is through this that he learns of Beth and Jennifer, two women whose e-mails are constantly flagged thanks to their weakness for procrastination and off topic conversation. Lincoln finds himself scanning their e-mails more often than he should and he all too quickly becomes a secret third party to their conversations. But it is more than that, feelings develop and he soon begins to wonder if a relationship could ever be possible. To start with I found this to be a very give or take book. I dipped in and out of it whenever the fancy took me but I didn't feel an overwhelming need to read it as quickly as possible. About one third of the way through however, that all changed, and I pretty much inhaled the rest of it. Overall it was easy to follow and a joy to read, it was littered with good wit and snippets of romance. The role of friendship and love was dealt with in an original and unique way and it was a refreshing take on a topic that one may consider to be overdone in the literary world. The book alternated between e-mail exchanges between Beth and Jennifer and Lincoln's own storyline. I liked the different approaches to telling a story, the half formed images that an e-mail gives, leaving a lot unsaid and open to interpretation. I liked how the reader saw Beth and Jennifer just as Lincoln did and such I was able to form my own opinions of them, untainted by his own. The characters had a god sense of humour and were likeable but also incredibly normal. I liked that despite this being a chick lit of sorts, the main character was in fact a man. The genre is one typically dominated by women fawning over men, it was nice to see the tables turned and it worked incredibly well. The loneliness and lack of direction that Lincoln feels is something that most people can relate to in some form. The characters of Beth and Jennifer were equally relatable and each of the three characters represented different aspects of the perils of adult life and responsibility. This book is cute and witty, there is a good splash of friendship and romance without it being gushy or overly sweet. It is an easy read and one that I really enjoyed. Would I recommend it? Of course I would! Let me know if you have read it or any other Rainbow Rowell books!